Bulang Pu-erh is famous for its strong Cha Qi and intense sweet aftertaste. 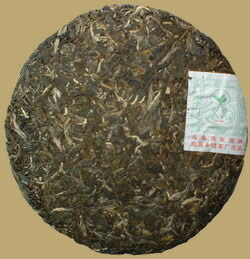 This early spring picked green beeng cha was produced by Yongming Tea Factory, the taste is very smooth and moderate astringency and bitterness become sweet quickly. It has been aged a few years to bring out developed flavors and may be drunk immediately or put away for further aging.